Relaunch of the Mermaid; Enter Wet Aero Inc. 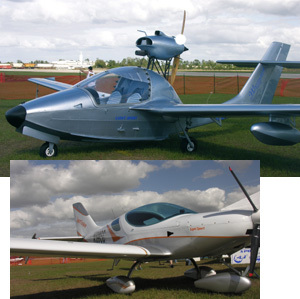 The first amphibian to achieve Special Light-Sport Aircraft status (in February 2006), Mermaid also helped break the infamous "repositionable gear" logjam. The $149,000 Mermaid is available with a Rotax 912 or Jabiru 3300 engine. Some LSA enthusiasts know of a struggle between Czech Aircraft Works and an investor group called Slavia Capital. The latter has been aggressive in their attempts to take over CZAW...unsuccessfully, thanks to the bulldog tenacity of American founder, Chip Erwin. Despite the battle, while CZAW has done well with their SportCruiser in 2008, climbing to the #8 position in overall registrations. Yet something had to give; CZAW's amphibious Mermaid never entered production. 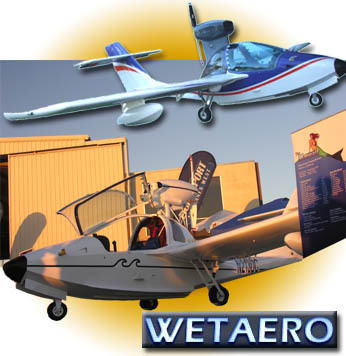 *** Now Mermaid is returning to the market under the name Wet Aero, Inc., though you know proprietor Danny Defelici as the U.S. partner to CZAW. While the SportCruiser builder fends off the aggressor, Defelici said, "I felt it was necessary to get [Mermaid] into production." Wet Aero has set up its own facility in Kunovice (near CZAW) in the eastern Czech Republic to manufacture the flying boat's major aluminum sections. Final assembly will occur at the Wet Aero's Indiantown, Florida base. "We have five aircraft that are in the finishing stages of putting the engines on," says Defelici. *** You can check specs here but one big development is the availability of either the 120-hp six cylinder Jabiru 3300 or the 100-hp four cylinder Rotax 912S. Some LSA enthusiasts know of a struggle between Czech Aircraft Works and an investor group called Slavia Capital. The latter has been aggressive in their attempts to take over CZAW…unsuccessfully, thanks to the bulldog tenacity of American founder, Chip Erwin. Despite the battle, while CZAW has done well with their SportCruiser in 2008, climbing to the #8 position in overall registrations. Yet something had to give; CZAW’s amphibious Mermaid never entered production. *** Now Mermaid is returning to the market under the name Wet Aero, Inc., though you know proprietor Danny Defelici as the U.S. partner to CZAW. While the SportCruiser builder fends off the aggressor, Defelici said, “I felt it was necessary to get [Mermaid] into production.” Wet Aero has set up its own facility in Kunovice (near CZAW) in the eastern Czech Republic to manufacture the flying boat’s major aluminum sections. Read More About: Mermaid Wet Aero, Inc. Developer Danny Defelici poses by the Czech Aircraft Works Mermaid at his home base of Naked Lady Ranch. The inset photo shows the water rudder that decends from the aerodynamic rudder (via a cockpit lever). Continuing the tour of floatplanes (yes, I remember it's winter up north even while I tour the tropical south, but what a good time to think about warmer days to come)...we paid a visit to the home field of Sport Aircraft Works. SAW is the U.S. marketing arm for Czech Aircraft Works (CZAW) and their SportCruiser, Parrot, and Mermaid. SAW proprietor Danny Defelici aided CZAW in the development of all three LSA. *** A crowning achievement was completing work on the amphibious Mermaid. I was the lucky first U.S. journalist to fly Mermaid! With its 120-hp Jabiru 3300, Mermaid performs well on land or water. Hiking up or dropping the gear is done via an easily-reached, hand-pumped hydraulic lever in the center console. Taxiing up on a beach proved effortless. Danny has taken CZAW's Mermaid and fashioned an enjoyable amphib, coincidentally the first such to gain an FAA exemption allowing a properly trained Sport Pilot to, ahem...reposition the gear. Continuing the tour of floatplanes (yes, I remember it’s winter up north even while I tour the tropical south, but what a good time to think about warmer days to come)…we paid a visit to the home field of Sport Aircraft Works. SAW is the U.S. marketing arm for Czech Aircraft Works (CZAW) and their SportCruiser, Parrot, and Mermaid. SAW proprietor Danny Defelici aided CZAW in the development of all three LSA. *** A crowning achievement was completing work on the amphibious Mermaid. I was the lucky first U.S. journalist to fly Mermaid! With its 120-hp Jabiru 3300, Mermaid performs well on land or water. Hiking up or dropping the gear is done via an easily-reached, hand-pumped hydraulic lever in the center console. Taxiing up on a beach proved effortless. Danny has taken CZAW’s Mermaid and fashioned an enjoyable amphib, coincidentally the first such to gain an FAA exemption allowing a properly trained Sport Pilot to, ahem…reposition the gear. 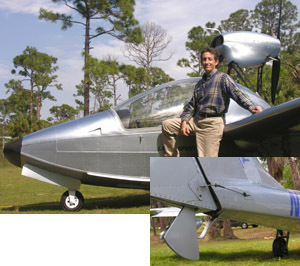 This pair of all-metal Light-Sport Aircraft from Czech Aircraft Works represent two of three models the American-owned company has certified to SLSA standards (the other is the Parrot). In particular note the Mermaid engine sitting up on struts. And watch for my SportCruiser report to post here soon. At the Sebring LSA Expo, visitors saw two airplanes they'd seen before, but these were actually revised models that are now ready for waiting pilots. The Mermaid charmed the LSA world when it was first introduced, since collecting more than 200 order deposits. The boat hull LSA also earned the first of two exemptions regarding the "repositionable" gear detail that has so befuddled FAA lawyers. The agency says it will fix this part of the SP/LSA rule by May 2007 but Mermaid is one of only two amphibs that allow Sport Pilots to reposition the gear. [UPDATE: LSA Aero's Freedom S100 also recently won an exemption.] Mermaid's engine now sits up on struts. Not only does this look great, the change has solved prior challenges of the Jabiru 3300 engine installation. It is also said to decrease noise. *** SportCruiser may look the same to you but the "third generation" model is said to fly better and it certainly looks sleeker with its beautifully shaped canopy. The 3G SportCruiser generated several sales at Sebring. At the Sebring LSA Expo, visitors saw two airplanes they’d seen before, but these were actually revised models that are now ready for waiting pilots. The Mermaid charmed the LSA world when it was first introduced, since collecting more than 200 order deposits. The boat hull LSA also earned the first of two exemptions regarding the “repositionable” gear detail that has so befuddled FAA lawyers. The agency says it will fix this part of the SP/LSA rule by May 2007 but Mermaid is one of only two amphibs that allow Sport Pilots to reposition the gear. [UPDATE: LSA Aero’s Freedom S100 also recently won an exemption.] Mermaid’s engine now sits up on struts. Not only does this look great, the change has solved prior challenges of the Jabiru 3300 engine installation. It is also said to decrease noise. *** SportCruiser may look the same to you but the “third generation” model is said to fly better and it certainly looks sleeker with its beautifully shaped canopy. Interested In Amphibs? If Yes, Plan to Write FAA! Czech Aircraft Works has designed the Mermaid, seen here flying as prototype #2. They've enjoyed a very strong response to the bird. Their petition can help the whole industry get amphibs selling. Many of you are aware of FAA's confused state over "repositionable gear" for LSA floatplanes. At present the agency is stalled regarding the issue. I understand from highly placed officials that a solution could be to allow one gear movement per flight. That would fix the problem but changes move very slowly in the federal bureaucracy. To kick start action, one active producer of floats and flying boats -- Czech Aircraft Works, and their U.S. partner, Sport Aircraft Works -- has swiftly gotten the agency to release a "Petition for Exemption." The usual dense federal language describes the petition, but Sport Aircraft Works has made responding much easier. Go to their website and follow the directions; they provide a link to the FAA submission site. Comments must be received by March 6, 2006, so if this matters to you (and it should! ), then please take action quickly. Many of you are aware of FAA’s confused state over “repositionable gear” for LSA floatplanes. At present the agency is stalled regarding the issue. I understand from highly placed officials that a solution could be to allow one gear movement per flight. That would fix the problem but changes move very slowly in the federal bureaucracy. 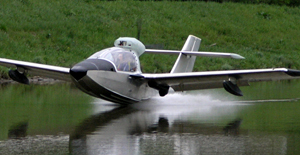 To kick start action, one active producer of floats and flying boats — Czech Aircraft Works, and their U.S. partner, Sport Aircraft Works — has swiftly gotten the agency to release a “Petition for Exemption.” The usual dense federal language describes the petition, but Sport Aircraft Works has made responding much easier. Go to their website and follow the directions; they provide a link to the FAA submission site. Comments must be received by March 6, 2006, so if this matters to you (and it should! ), then please take action quickly. First Amphibian Wins SLSA; Welcome, Mermaid! With good seaplane flying coming soon, Sport Aircraft Works can now start deliveries on the Mermaid amphib that has proved so popular at shows. For more info, call 772-223-8915 (in Florida). With 191 Mermaid orders on the books, Sport Aircraft Works (SAW) is understandably anxious to start deliveries. The trouble is -- or the advantage is, if you're a willing buyer -- that Mermaid is an amphibian. That means it has gear that moves, or..."repositions." The repositionable gear dilemma remains unresolved, despite the petition for exemption by Czech Aircraft Works. So for now, says SAW's Danny Defelici, "We'll be placarding the Mermaid against moving the gear in flight." He added that at the recent Sebring Expo, several top FAA officials looked for a reason that Mermaid could not be SLSA certified. "They found nothing to prevent it, so we went ahead and obtained our certificate," Danny explained. Mermaid is #28 to win SLSA credentials. While the agency figures out its response, an exemption process could allow all floatplane or amphib producers to go forward with deliveries in time for the summer season. With 191 Mermaid orders on the books, Sport Aircraft Works (SAW) is understandably anxious to start deliveries. The trouble is — or the advantage is, if you’re a willing buyer — that Mermaid is an amphibian. That means it has gear that moves, or…”repositions.” The repositionable gear dilemma remains unresolved, despite the petition for exemption by Czech Aircraft Works. So for now, says SAW’s Danny Defelici, “We’ll be placarding the Mermaid against moving the gear in flight.” He added that at the recent Sebring Expo, several top FAA officials looked for a reason that Mermaid could not be SLSA certified. “They found nothing to prevent it, so we went ahead and obtained our certificate,” Danny explained. Mermaid is #28 to win SLSA credentials. While the agency figures out its response, an exemption process could allow all floatplane or amphib producers to go forward with deliveries in time for the summer season.